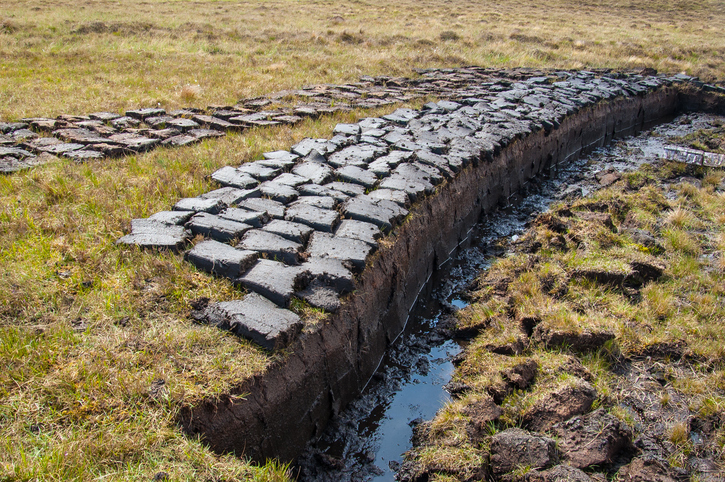 Bogs are common in Ireland and Scotland, where peat is cut from them. A bog is an area of wet, moist, and spongy ground and the verb to bog, usually followed by down, means ‘to sink in or as if in such an area.’ In UK slang, bog means ‘toilet’ and, if you are talking about a public toilet or the toilet facilities in a establishment open to the public, like a bar or restaurant, then the word is often used in the plural. If you walk across country at night, you need to be careful not to fall into a bog. The car bogged down in the mud. I won't be a minute; I'm just going to the bog. Do you know where the bogs are in this pub? Bog dates back to around the year 1500. The noun, meaning ‘an area of wet, spongy ground,’ came into English from the word bogach (pronounced bog-aghk), which existed in both Scots Gaelic and Irish so it could have come from either). Bogach itself is a noun created from the adjective bog (soft or moist) in these languages, and can be traced back to the Proto-Celtic buggo– (flexible) and the Proto-Indo-European bheug– (to bend). It is distantly related to many other English words, such as bow, bagel, buxom and elbow. As UK slang for toilet, bog is short for bog-house (slang for out-house), back from when toilets were usually outside a home, and dates back to the late 18th century. The verb, meaning ‘to sink something or someone into a bog,’ comes from the noun, and dates back to around the year 1600. The transitive sense, ‘to sink in a bog,’ appeared around the year 1800, and has been used with down since the mid-19th century, especially in US English.